H: 1 ft. 6 1/2 in. x W: 2 ft. 1 in. x D: 1 ft. 6 7/8 in. This elaborately carved Regence stool is part of a set of furniture consisting of two stools, two settees, and six armchairs. 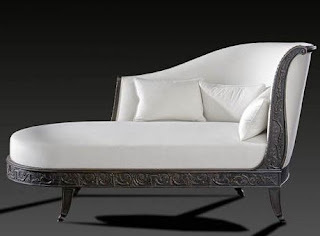 The set may have originally furnished the Paris house of the wealthy financier Pierre Crozat, Treasurer of France; an inventory taken after his death in 1740, describes a similar but larger suite of furniture. 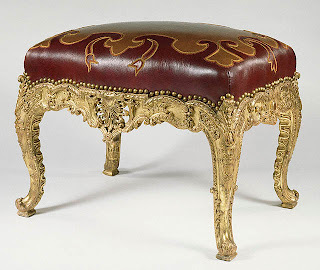 When the Getty Museum acquired the stool, it had been stripped of its gilding and its original leather upholstery. 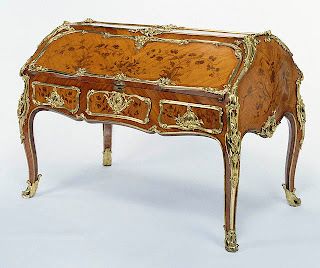 Conservators replaced the gesso, the gilding, and the appliquéd leather with its cream and red silk ribbon, using the existing chairs, two of which are now in the Musée du Louvre, as a model.